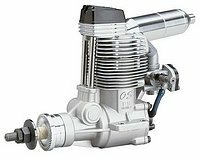 RC Model Aircraft Engines:The Gasoline Engine. 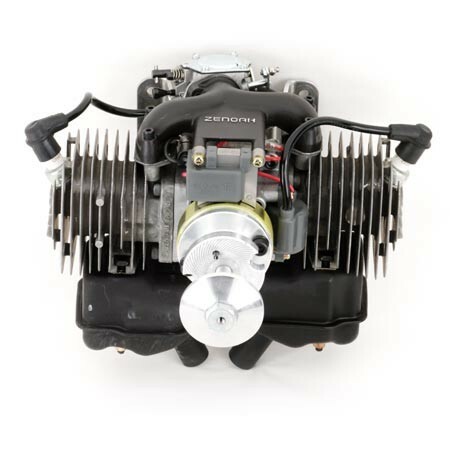 In the world of model aircraft engines, the gasoline powered type is the popular choice for large scale and aerobatic types. Hints on running and maintenance. Gasoline powered engines have been available for some time now. A lot of them are converted from chain-saw engines. This may not sound too encouraging, but realize that chainsaws need to be light, powerful and vibration free. The same requirements as those for model aircraft engines! Gas engines are very reliable and require little support equipment. They are clean running and have a realistic sound. Compared to the larger glow engines, fuel cost is less-even at today's gas prices! The majority of gas engines use a Walbro carburetor that incorporates a fuel pump. This feature makes the fuel tank placement much less critical, compared to a glow engine. The carburetor has high and low speed needle valves as well as a choke. The ignition system use a small spark plug(s) and usually use a sold state system for spark generation. The majority of gas engines are 2-strokes so maintenance is at a minimum. The spark plug may need it's gap checked and as always ensure the fuel supply is well filtered. The smallest gas engine currently available is of 26cc (1.6 cu.in.) capacity. The largest size, at least in normal large scale models is 150cc(9 cu.in.) Even larger sizes are available for the really big models. Many are available as single cylinder models but twins and radials are also made. The multi-cylinder units produce less vibration than the single cylinder model aircraft engines. Ensure the model is restrained and stabilized by your helper. Close choke and turnover propeller two or three times, ensuring the engine is not flooded. Ensure throttle is set to LOW. Flip propeller with a gloved hand smartly. Engine should fire once and stop. Engine should start and run. Adjust high and low speed needle valves, ensuring high speed is not too lean and low speed has a reliable idle. The great advantage of gas engines is that very little support equipment is needed. No glow plug igniter or electric starter is required. Please use a heavy glove to protect your hand and fingers-these engines are not TOYS and can inflict serious injury. Let SAFETY be your PRIORITY! Note that some gas engines have a spring starter built in that makes the "propeller flipping" that much easier.